Permanent marker is designed to resist fading, cleaning and removal. In most cases, permanent marker cannot be removed from painted walls. Here are some tips to determine if removal is possible from wall coverings, paneling and ceramic tile. 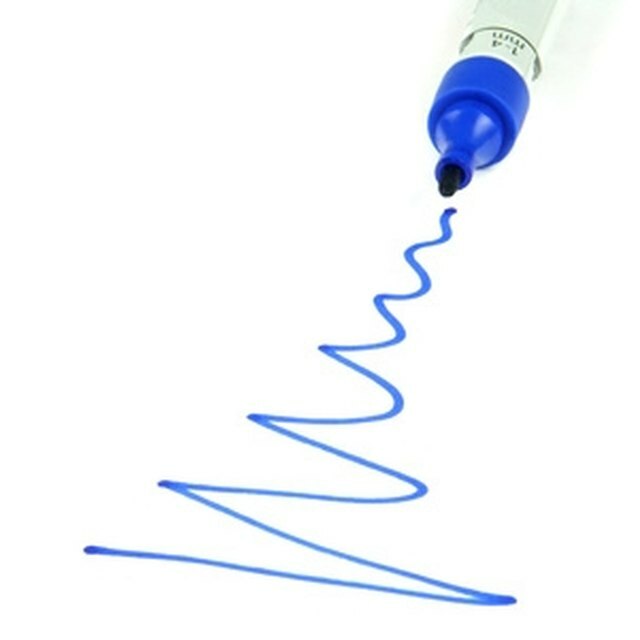 Permanent marker is designed to resist fading, cleaning and removal. In most cases, permanent marker cannot be removed from painted walls. Here are some tips to determine if removal is possible from wall coverings, paneling and ceramic tile. At all times during this process, use the rubber gloves to protect hands. If the surface is a vinyl wall covering, dampen the rag with rubbing alcohol. Lightly wipe the permanent marker with the cloth and determine if any color has been removed from the wall. If the marker is lifted, continue this process until the marker stain is removed. If the surface is vinyl wall covering but the stain does not lift using rubbing alcohol, dampen a clean, dry rag with lacquer thinner. Test the wallpaper in an out-of-the way area to determine if the lacquer thinner removes the marker. If the stain lifts, continue until the stain is completely removed. If the surface is paper, cloth or fabric, the permanent marker cannot be removed. The wall covering must be replaced. Wash the wall with light-duty spray cleaner and a paper towel to remove any residue. Dampen a clean dry cloth with rubbing alcohol. Rub the stain in a circular motion. The alcohol will loosen and lift the stain. After the stain is removed, wash the wall with light-duty spray cleaner and a paper towel to remove residue. Apply rubbing alcohol to the clean dry cloth. Test a small section of the paneling to ensure the solvent will not lift the finish from the paneling. Rub the marker lightly in a circular motion. Check to determine if the stain is lifted by the solvent. If the marker is being lifted, carefully continue until the stain is completely lifted. Wash the wall with light-duty spray cleaner and a paper towel to remove residue. If the marker is not being lifted, the paneling must be replaced. Apply baking soda toothpaste to a dry clean cloth. Buff the surface in a circular motion. In some cases, the baking soda and toothpaste combination will remove the marker without damaging the paint. Wash the wall with light-duty spray cleaner and a paper towel to remove residue. Do not apply lacquer thinner to wood paneling. This strong solvent will remove the finish from a wood paneled wall or damage the surface of a vinyl imprinted wood paneling.